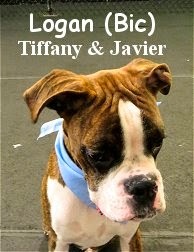 Fort Fido Dog Daycare & Boarding News Blog: Logan lives it up! We had a real winner show up for their assessment this morning. Meet Logan! He is a cool, seven month old, brindle, Boxer. Logan tried our Medium Roll on for size and thrived. Once there, he instantly took to greeting the pack that arrived. "Play" was the name of Logan's game, and that he did! Logan jumped, ran, ducked and dove all over the play area, with several different playmates. He speaks fairly good "Dog" for a pup, so making buddies was easy for him. Logan really enjoyed Oliver and Zoey's company, among others. We believe he will continue to learn, grow, and have a good time here. Ya never know, he may even graduate to the Big Roll some day. Here are three wonderful clips of Logan in action. First-rate job today bud, rest up, cause we shall see you again real soon! "Ruby with the eyes that sparkle"